Merchandising and Display Workshop in one week. Register today. Parking instructions below. Visual display merchandising maximizes merchandise sales using product design, selection, packaging, pricing, and display that stimulate consumers to spend more. 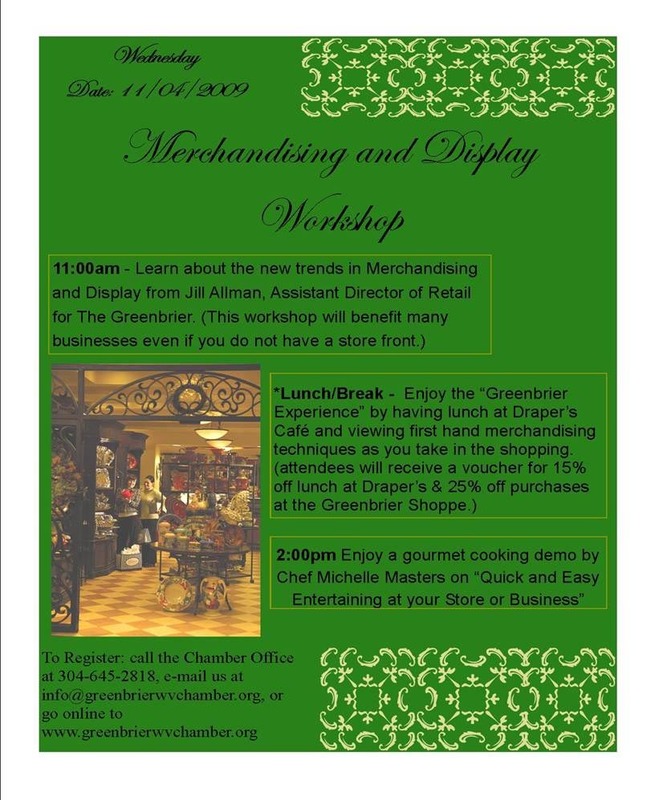 Jill Allman, Assistant Director of Retail for The Greenbrier will be presenting a mini workshop on this topic for the Greater Greenbrier Chamber of Commerce on November 4 at 11 am. Participants can then see examples of effective merchandising while shopping at The Greenbrier and enjoying The Greenbrier experience by lunching at Draper’s Café. Participants will be offered discount vouchers for Draper’s and The Greenbrier Shoppe. The day ends after a 2 pm gourmet demonstration in the Gourmet Shoppe on “Quick and Easy Entertaining in Your Store or Business”. The workshop is complimentary for Chamber members and $10 for non-members. Registration is required and can be completed online at www.greenbrierwvchamber.org or by calling 304-645-2818. Please park at the train station and a shuttle will take you to the North Entrance. Go through the shop corridor and through the lower lobby (which is undergoing renovations) and down the hall to the theatre. Please allow time to be there before 11 am to register. Justice unveils low price for residents of W.Va., Va.
WHITE SULPHUR SPRINGS — Jim Justice, owner and chairman of The Greenbrier, on Wednesday unveiled an unprecedented offer exclusively for West Virginia and Virginia residents to stay at the luxurious resort for $59 per night. The Tribute to the Virginias package is only available on the nights of Nov. 15-16 and Dec. 18-20, as well as Jan. 8-10 and Feb. 5-7, 2010. Since buying the resort earlier this year, Justice has many times spoken of his affection for the Mountain State and its residents. He heaped praise on the Spa City, home of The Greenbrier, citing its friendly people, low crime rate and the beauty of the changing seasons as a significant part of the allure of the resort. This celebration of the resort’s recent successes also includes $20 in Match Play coupons per night for The Tavern Casino, complimentary greens fees and 20 percent off on all other outdoor activities, including falconry, off-road driving, mountain biking, sporting clays, carriage rides and horseback riding. In addition, dinner dances, featuring a spectacular themed buffet, either A Celebration of the Virginias or A Taste of The Greenbrier, will be available on select dates at a rate of $45 per person. The daily resort fee is waived for guests on this package, but county and state taxes apply. This rate, based on single or double occupancy, is valid for standard rooms only; add-on rates apply for premium rooms, including suites and guest houses. A limit of two rooms per guest may be booked at this rate. A non-refundable deposit equal to all room and tax charges is due at the time of booking. This package is only available on select dates and for two nights maximum. A valid photo ID, with proof of residency, must be shown at check-in. Children’s Home Society will be hosting the October 22 Business After Hours of the Greater Greenbrier Chamber of at their location at Seneca Trail , Fairlea from 5:30 to 7:30. The open house business social will allow the community to learn of the many ways that Children’s Home Society benefits are area. 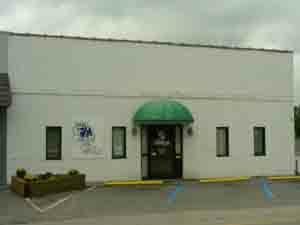 The Children’s Home Society began in 1896 with the sole purpose of finding homes for homeless and dependent children but has evolved into one of the nation’s leading non-profit agencies, serving children and their families in a wide variety of ways. Today, the Children's Home Society continues to find loving homes for children. It also helps keep families together by providing social casework, emergency shelter, family counseling and health care. The Society protects children from abuse and neglect, recruits and trains caring volunteers and works with other state and local agencies to meet the needs of West Virginia children. The programs of the Society are directed at ensuring the physical and emotional safety of children and their families, improving child and family relationships and preserving family and community ties. The following services are available to the community through the Lewisburg site: Emergency Shelter Care, Right from the Start (addressing the needs of high risk mothers and infants), WECANN mentoring program, Divorcing Parent classes, Adoption and Foster Care, as well as Youth Services. For more information on these programs, you can go to www.childhswv.org or attend the Business After Hours on October 22.
Business After Hours are a monthly networking program of the Greater Greenbrier Chamber of Commerce. Each month a business or non-profit is showcased and members enjoying meeting and greeting fellow members of the business community. To learn more about the Chamber, please call 645-2818 or go to the Chamber website. Register to attend the October Business After Hours by going to www.greenbrierwvchamber.org call the Chamber office or reply to this e-mail. 9579 Seneca Trail South, Fairlea, WV – 219 North 1/4 Mile on Left passed the Fairgrounds.